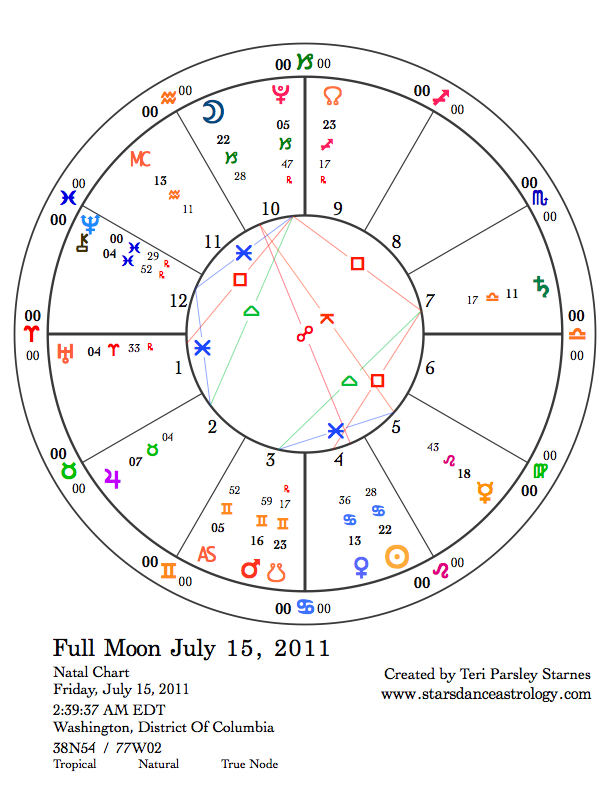 Every time I see the glyph for Cancer in a chart, I substitute the word “soul.” And soul means depth. It is connected to the past, to memories, to the unconscious. Even though, Cancers can be just as involved in the outer world of manifestation as anyone else, the real work of Cancer is concerned with the deep work of Soul. Cancer’s constellation is the dimmest in the sky and quite small, hard to see. It is fitting that a sign oriented to interior emotional awareness should forego the drama of visible light. 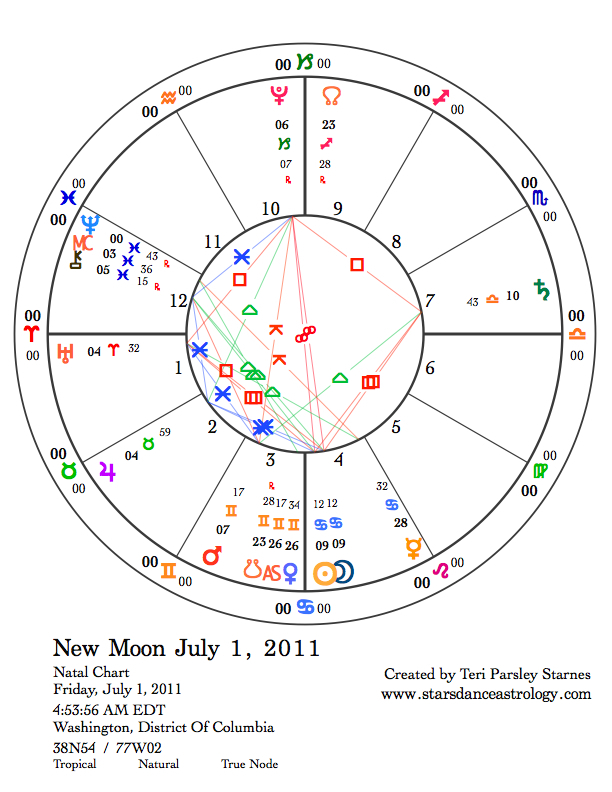 Cancer’s house in the Natural Wheel begins at the lowest point in the chart, the Nadir. It was to this part of the sky, that the Egyptians believed the Sun returned each day to die and be reborn. Entering the liminal place of soul. This month, allow yourself to let go of externals and the obligations of your ordinary life. The liminal space between doing and being is a place where the soul is nourished, especially if we slow down enough to also experience our own discomfort with the stillness. Soul work sometimes is uncomfortable. We are used to being busy and distracted. Yet, stepping between doing and being, we return to source and this replenishes our capacity to give back to life. What is at your source? The word source comes from roots meaning to rise. Imagine journeying to the nadir of self, reconnecting to what lies there and rising back again. Imagine rising through pools of water, cleansing, nurturing, soothing. The work of summer, when the living is easy, is to recharge and restore ourselves so we may move next into the productive work of harvest and preparation for winter. 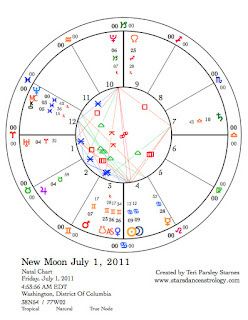 New Moon in Cancer (Solar Eclipse). 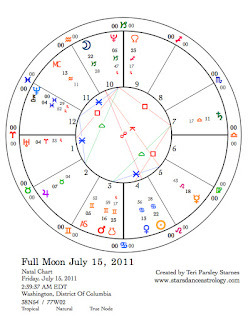 The Soul Moon is part of a grand cardinal cross involving Pluto, Uranus and Saturn. This configuration intensifies the need to do our soul work. Grand crosses can feel like we are stretched to the max. What has reached its breaking point in you? Transits involving Pluto, Uranus, and Saturn this month will call attention to our stresses. Listen to what you need. Jupiter in Taurus plays along with the Cancer theme well, reminding us that the body holds a lot of soul wisdom too. Find a way to honor your body. Transits involving Venus this month are particularly strong times of listening to the body and following our bliss. Full Moon in Capricorn. Full moons bring illumination. If you have listened to your soul, now is the time to look upon the pearl that resides in the heart of your soul. Something is illuminated about who we really are. A pearl is the gift we receive from the irritating grain of sand that annoys and disturbs us. It is worthwhile to look at how we handle our emotions and how they handle us. James Hillman (author of the quote above) writes brilliantly about the soul. He believes that it is important in the work of soul-making to avoid pushing ourselves towards a goal. The gift, the pearl, the self-awareness that arises is secondary to the process of surrender and replenishment. It is a mysterious journey that cannot be forced but must wash over us like a wave. Allow that wave to wash you.